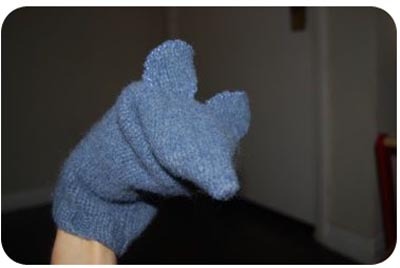 This puppet pattern for a felted sweater is so simple you'll want to make a whole family of sweater mouse puppets in no time! Using a felted wool sweater is ideal because the edges won't unravel so minimal sewing is required. Making a Felted Sweater: Go to your local thrift store and find a 100% wool sweater. Bigger is better because you get more fabric that way so be sure to hunt in the men's section. You can often find incredible deals if the sweater has holes or stains, which won't matter to you since it is just for the fabric! Garage sales are also a good place to hunt for them, especially during the hot summer when nobody is interested in buying sweaters. Wash the sweater in a top loading washing machine with a little laundry soap on HOT water with a towel or two...or even a full load of laundry. The extra items create more friction which will help felt it. If you have a front loader you still can felt it, just throw in a towel and a few clean tennis balls. When the load is finished throw it into the dryer, also on hot. The result will be a tightly felted tiny sweater! An XXL men's sweater that I felted recently shrunk more than 50% and became a woman's size small. The tightly bound fabric though is perfect since now you can cut it and the sweater won't unravel. 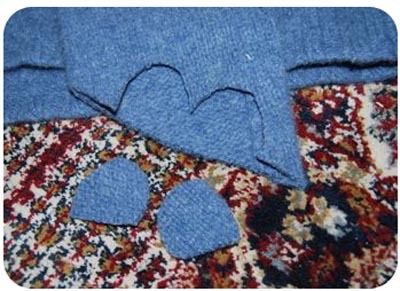 Cut off one sleeve of the felted sweater at an angle. The point of the angle will become the mouse's nose. The great thing about this puppet pattern is that the sweater sleeve is the perfect size to fit your hand through and the edge is already finished. 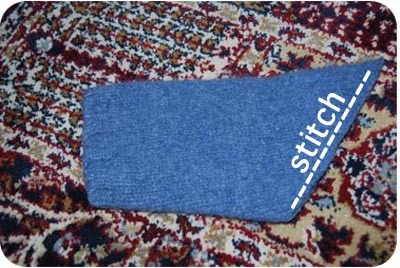 Turn inside out and then stitch up the angle. Hand stitching is just fine but you can use a sewing machine if you want for this puppet pattern. Cut out two circles with flat bottoms for the mouse ears. Make these as large or as small as you like! 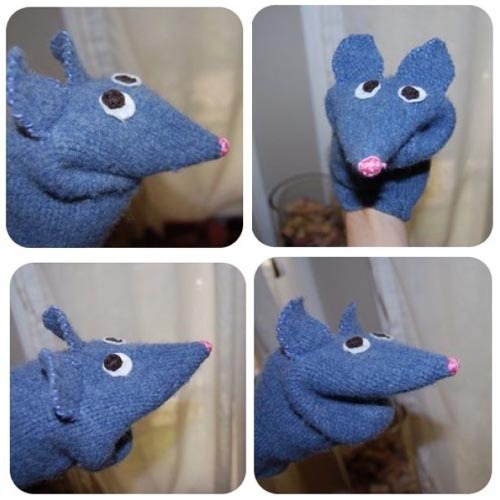 Each mouse puppet you do will have his or her own personality due do the slight variations. 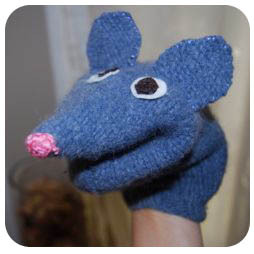 Turn puppet right side out and place on your hand with your sewn seam in the mouse's mouth. Pin on the ears until you are happy with the placement and then sew on the ears. You can sew on felt circles for the eyes & nose, embroider them or use plastic google eyes or buttons! These items can be sewn on or simply glued on with a hot glue gun for older children. Please note, for small children, embroidery or felt is better since buttons could pose a choking hazard. Now come up with some silly voices and you are all set for puppet play! Go to the Make Baby Toys Section for more project ideas! Back to the top of the Puppet Pattern from a Felted Sweater page.